Hans Peter Nielson Gammel, Compiler. The Laws of Texas 1822-1897. Austin: The Gammel Book Company, 1898. 10 volumes. Full sheep. Hans Peter Nielson Gammel (1854-1931) was born in Denmark and immigrated to the United States with his brother in 1874. After arriving in Austin in 1877, he entered the book trade, securing a board between two trees and selling books for ten cents. This humble enterprise blossomed into one of the earliest sizeable bookstores west of the Mississippi, and later a publishing house. H.P.N. Gammel died in Austin in 1931 and his son, H. P. N. Gammel, Jr., continued in the business until his death in 1941. 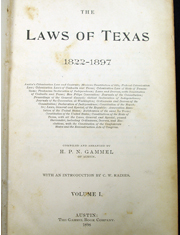 Although H. P. N. Gammel published a number of titles, his most important contribution to Texas was his compilation of the laws of Texas from their early origins through his own period: The Laws of Texas 1822-1897. Although the compiler’s notice states only that the “collection of the documents cost me much labor and research,” tradition holds that the compilation grew out of the sodden papers H. P. N. Gammel rescued from the ruins of the 1852 Texas Capitol building when it burned on November 9,1881. He and his wife painstakingly dried the sheets, and then stored them for more than a decade. According to the notice in the first copies printed in 1898, Gammel intended to issue one volume every sixty days until the ten volume set was complete. A complete set in 1902 cost $100. John C. Townes, the first dean of the University of Texas School of Law, reviewed the work for the Texas Historical Association Quarterly in 1902, noting that it performed the much needed service of providing all the Texas statutes in one place at a reasonable price. The compilation remains one of the best sources available for nineteenth-century Texas law, and its unusual blended system of civil and common law. The original ten volume set was supplemented by a sessional volume from 1899 through 1937. The first ten volumes – especially as a complete set – are both rare and valuable. An indication of both the continuing utility of the compilation and the difficulty of securing an original printing is the reprint of the first ten volumes and index in 2004. The set pictured above is a gift of the Gammel family, from the library of John Ledel Gammel (1924-2011), grandson of H. P. N. Gammel. He inherited his grandfather's love of books and collected over 10,000 volumes. This set of Gammel's Laws of Texas were among his most cherished. John Ledel Gammel was survived by his wife of 64 years, Mary Juanita Hill Gammel and their five children, George Michael, Cheryl Ann, John Christopher, Jan Tinka and Peter Ledel. On the occasion of Juanita's 90th birthday, this set of Gammel's Laws of Texas was donated to Tarlton's rare book collection. This is the library’s only copy in the original sheepskin bindings.